Maddie is a eight-year old Pit Bull mix who lives in Omaha with a pretty crazy pack of dogs; Charlie a four-year old Pit Bull mix, Stitch a two-year old French Bulldog and Capone a one-year old French Bulldog. 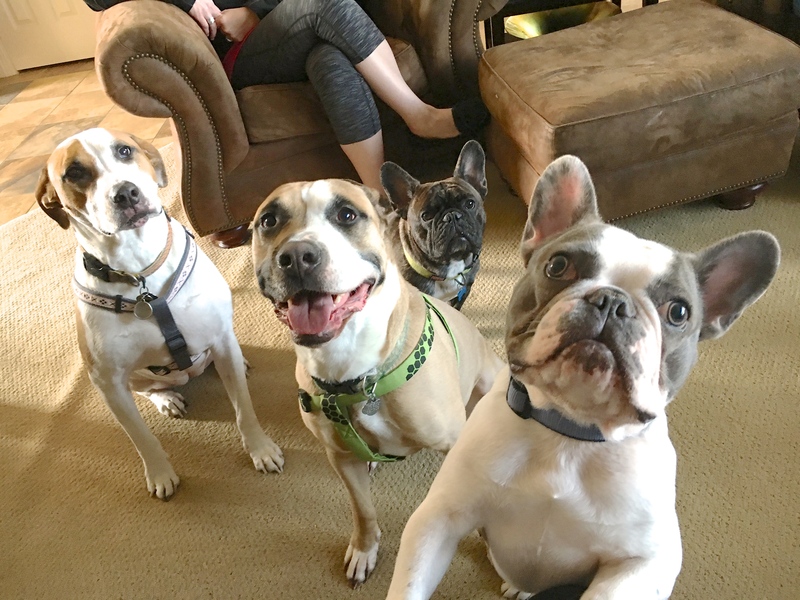 While there were many individual issues that led the humans to setting up a dog behavior training session, the primary issues were over excitement and a lack of structure that had confused the dogs into thinking that they had the same authority as each other and the humans. Because Maddie had been going after the dogs for being overexcited or out of control, the guardian kept her in the kennel when I arrived so I could see just how out of balance the rest of the dogs were. I’ll let you take a minute to watch the video below before I comment further on their behavior. When I sat down with the dog’s family members, they struggled to ask one of the first questions I ask all my clients; what rules do your dogs have? Dogs go through life probing to determine boundaries and limits. If we don’t have many rules, we don’t spend much time leading and correcting them. Over time this can cause the dog to think they are peers with their humans. If a dog thinks of you as a peer instead of an authority figure, then listening to you becomes optional. I suggested a number of rules and boundaries and shared some dog behavior tips to help them head of issues before they start. Observation allows us to see a dog is about to do something unwanted before they actually to the unwanted deed. This makes it easier to correct or distract them. Next I started sharing some dog training secrets, but Charlie was such an excited dog I knew we needed to help him release it before I would be able to effectively start helping dogs and humans alike. Besides this gave me an opportunity to engage in my favorite form of dog exercise, something I like to call Dog skiing. I strapped on a pair of rollerblades and had his guardians put Charlie on a harness. 15 minutes later Charlie was pooped and plopped down on the floor. Now that the energy was much calmer and the dogs were back in balance, I was able to start working with the humans and dogs.